Available from 25mm to 90mm diameter in 50m coils from stock. Designed to provide a high level of protection against soil contaminants commonly found in brownfield sites, Puriton is a multi-layer compostite structure pipe, which combines the unique characteristics of polythylene (PE) with the exceptional barrier properties of aluminium (AL). Lightweight, flexible and corrosion resistant, the Puriton system is easy to install, without the need to post-wrap the finished joints. 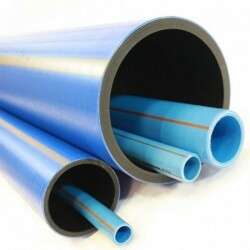 The pipe can be joined using most industry standard installation techniques with our comprehensive range of electrofusion and mechanical fittings, which have been specifically developed to give you assurance of a safe and durable solution which provides protction to your drinking water through contaminated land. Suitable for new and replacement drinking water systems.